Beer. Birra. Bier. - A blog about beer and brewing. : Single. Circle. Small. The beer I brewed here has now been in the bottle for two weeks. I've had a sample and I think it still needs some time; the carbonation is there but lacking and the overall taste is slightly young. The hop flavour and aroma is massive, bigger than when it went into the bottle. Despite mashing warm and using some added flaked barley; the beer lacks body and sweetness. It has a slight watery feel in the mouth and the hop flavour does taste somewhat 'stewed'. I set out to make a drinkable, full flavoured beer at 2.5 per cent. It looks like I've ended up with a drinkable, full flavoured beer at 2.7 per cent. It's not without fault, but it's far from bad. It'll be interesting to see what other people make of this, especially those that've tried the original Nanny State. As far as the name goes, it's simple really. 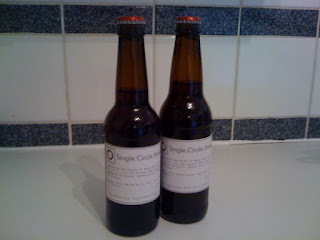 The beer is based on the small beer style, it was made with a single hop variety and on brew day it was labelled with a circle.